Kefalonia is world famous for its green landscape and the wonderful beaches. One of the most popular islands of Greece, Kefalonia is a big island and thus tourism is split to various resorts, making it keep an authentic and calm character. You will find below our excursions suggestions for 1, 2 or 3 days on the island of Kefalonia Greece. For a general idea, you can view the things to see and things to do in Kefalonia. The first day on the island, visit Argostoli, the capital of the island. The town has all facilities and a busy waterfront. Walk to the impressive lighthouse built in 1828 by the British ruler and see the view from there. Also walk up and down the Bridge de Bosset at the port. Then, go north to Myrtos, the most famous and photographed beach on Kefalonia. Myrtos has an impressive landscape, crystal water and it is considered one of the best beaches in the world! About 10 km north of Myrtos, there is Assos, a lovely village, partly tourist partly traditional. From the castle above the village, you will get a great view of the sea. In the afternoon, go to Fiscardo, a wonderful village on the northern side of Kefalonia, distinguishing for its colourful architecture. Fiscardo is the only village on the island that suffered no damages from the 1953 earthquake that hit the island. Many yachts and fishing boats moor in the small port, giving a cosmopolitan style. Fiscardo has nice fishing taverns at the waterfront. 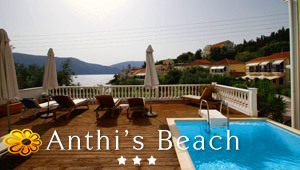 On the second day, take the road to Sami, a busy and tourist village 24 km east of Argostoli. On the way there, you will cross the inland of Kefalonia, an untouched tourist area with a nice forest to walk, if you like trekking in nature. About 3 km before Sami, there is Drogarati Cave, known for its wonderful formations of stalactites and stalagmites. After a coffee stop in Sami, continue about 5 km to the east and you will find Antisamos, a wonderful beach where some scenes from the movie Captain Corelli's Mandolin were filmed. Enjoy the crystal water and the green landscape. In the afternoon, go to Melissani, the other cave of Kefalonia, 3 km north of Sami. Boat trips are organized across this beautiful cave. In the evening, head a bit north to Agia Efimia, a tourist seaside village with nice taverns at the port to have a traditional dinner. The third day, go to Lixouri, a tourist village just a short boat ride from Argostoli. If you don't want to take the boat there, you can drive coast by coast there. This way, you can see the beautiful beaches and nature of Kefalonia and stop for a swimming in a wonderful beach, Petani.